Wear your fandom on your chest! Buy a Once Upon a Time-themed T-shirt! Click here to get your T-shirt! In the past, Anastasia and Will jumped into a portal that would lead them to Wonderland. But will their fate be how they expected it to be? In present Wonderland, however, the Red Queen asked Alice to come down off her high horse to make a deal that would hopefully solve the one problem they both share—Jafar. Jenny and Daniel had a catastrophic failure last night (ie; they experienced a very long power outage) as we were recording the Wonderland podcast yesterday but we’re back and made it! Having known from Once Upon a Time where they give us two separate stories that tie in with the present, it could be that timeline wise, Anastasia and Will come to Wonderland before Regina the Evil Queen’s curse hit (in Once Upon a Time), but probably after Cora come to Wonderland. Cora could’ve also killed the King that made her raise into power. However, we haven’t seen much of her so there aren’t much evidence yet that would guarantee this. The King’s palace is the same as the one the Red Queen is currently using, but seems different from the ones that Cora lived in. Could there be more than one palace within Wonderland? Anastasia’s mom wanted a queen for a daughter, much like Cora. She also mentioned about her sisters. Is Anastasia actually one of Cinderella’s step sisters? On the other hand, Ashley/Cinderella in Once Upon a Time wasn’t really British, although they are not really related so we never know… yet. 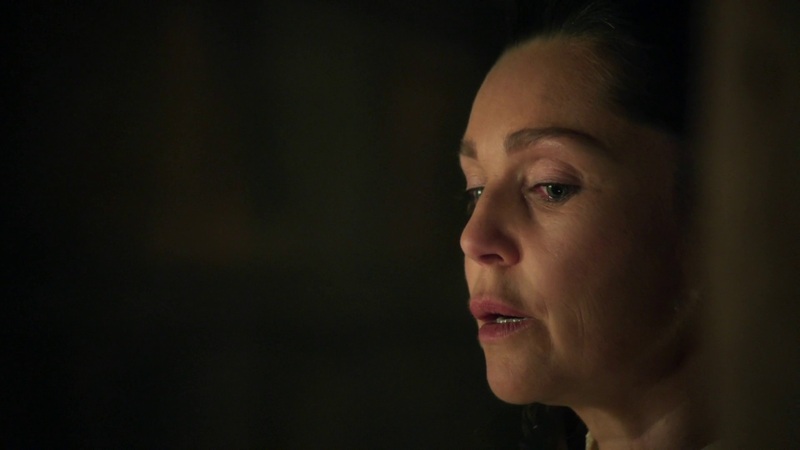 Anastasia’s mom was very much like Cora with Regina. If Regina had any sisters, could she have her way as well? Are Cora and Anastasia’s mom actually related to each other? If Cora and Anastasia’s mom sisters, that would make her Cora’s niece. So when Cora had to leave Wonderland to go back to the Enchanted Forest, did she asked her to take over the throne for her? We initially thought that Anastasia didn’t really love Will but this episode proves us otherwise. After seeing this episode, it really seemed like Anastasia’s love was genuine, even after she come to power as the Red Queen. 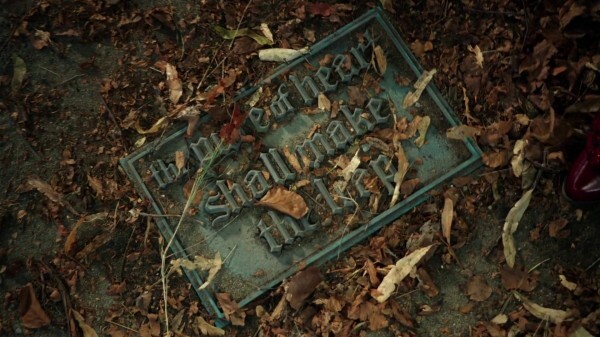 Moreover, Will eventually became the Knave of Heart. Did she killed the King and make him the Knave of Heart or did she convinced the King to give some rank to her old flame? Anastasia saying “steal from the rich and give to the poor” is a little nod to Robin Hood. However, Will was quick to say that he’s not a thief, kind of like the adage the end justifies the means. Moreover, the King kinda reminds us of Dustin Hoffman and President Snow from The Hunger Games. Anyway, he says that their world is filled with wealth, searching for a Queen for a long time. Is the King even married? To whom did the crowned jewels originally belong to? Emma Rigby’s performance was great ever since we’ve seen her from the Pilot episode; her character has really grown on us. Her portrayal of the Red Queen is getting even better than her as Anastasia. The King kept telling Anastasia that love isn’t enough; that while it is a noble thing, how far will it get her? it was sad to know that Anastasia stopped believing in her love with Will. Or did she? And by the way, how long did Will wait for Anastasia as she was stealing the crown jewels? He sent her to steal crowned jewels but she came back with a husband. Poor Will! 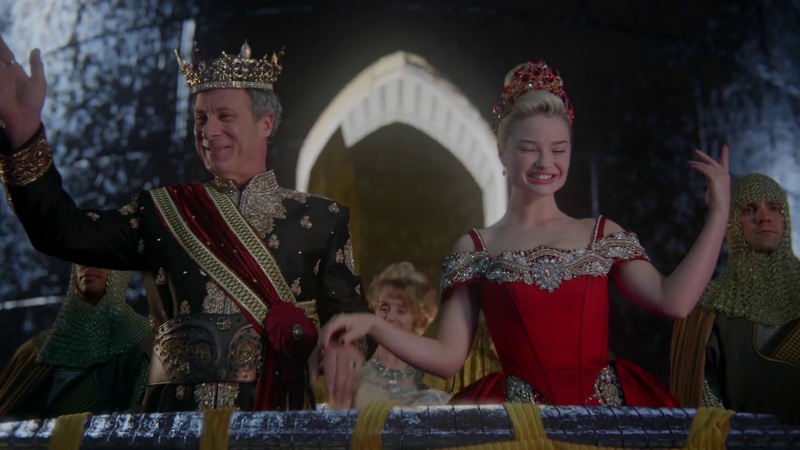 Lastly, is the Red Queen’s new husband actually the White King? What happened to the King after they get married? Did Anastasia do something to her? Is she keeping her as a prisoner? He said that her wanted her because Anastasia has a drive to be more than she is, which is what the king desires on his side, but what did happen to the King? You can sponsor an episode or more of WONDERLAND podcast, too! Email Daniel@WONDERLANDpodcast.com if you would like to arrange a corporate sponsorship of our podcast. The Red Queen come to Alice to made a deal to solve the one problem they both share — Jafar. She also said that Jafar is the means to an end. What sort does she have in mind? Did she simply want to protect herself? Can the magic dust protect her from dark magic, Jafar’s specifically? The magic dust, apparently was to be used to free Will. But just before Will turned back to his human form, the Red Queen disappeared. Did she sees Will as her protection from Jafar or is she really just still in love with him? She apologized to him after all; what is it for? For turning him into stone? Or for everything that she has done with him? Did he hear her apology? The Red Queen said that Jafar’s tower was not only hidden and shrouded by magic. But in the end, Alice was able to find Jafar’s tower. Now that she’s found Jafar’s tower, can Alice finally find Cyrus? Or will it be for nothing? 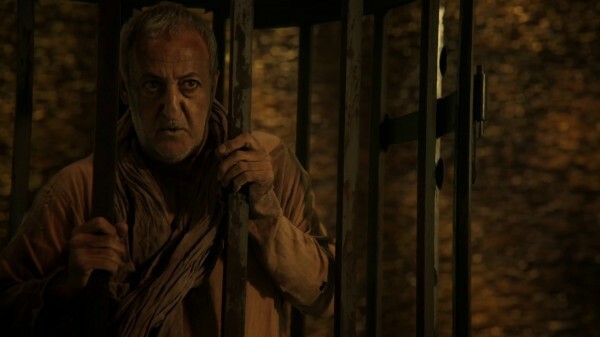 The man in the other cage said that he have something Jafar wants, but that he will never get. What is it that this man have? Is he really the Sultan, Jafar’s father? Or is he someone who has still one more wish left, just like Alice? He said that he’s been (in Jafar’s tower) long enough to see others try to escape. He also said that he had a life once, but it is lost now. Who is he really? Is he going to be part of what can defeat Jafar? Hopefully, he’s not (supposed to be) Princess Jasmin’s father. Knowing the show’s creators, they can even turn the events around after leading us to thinking one thing. We really liked how the Red Queen says to Alice, “If I’d wanted you to fall off a cliff, I’d push you!” as well as when she said “There’s a darkness everywhere when the sun goes down” so darkly. 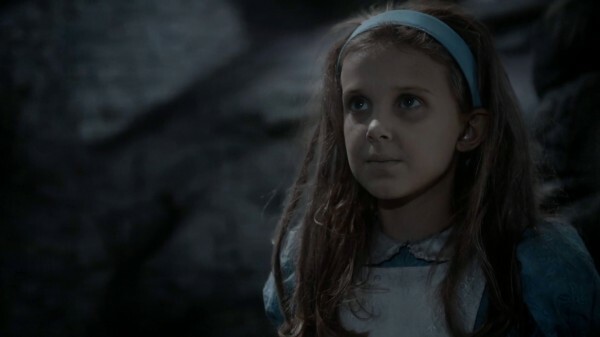 Young Alice is so creepy! The actress who plays her is really doing a great job in portraying the role. When the Red Queen fell down the cliff, the first thing she checks is her crown. Is that where she draws her power from? In addition, she seemed surprise when her magic doesn’t work down the great divide. Does no one in Wonderland die from falling? 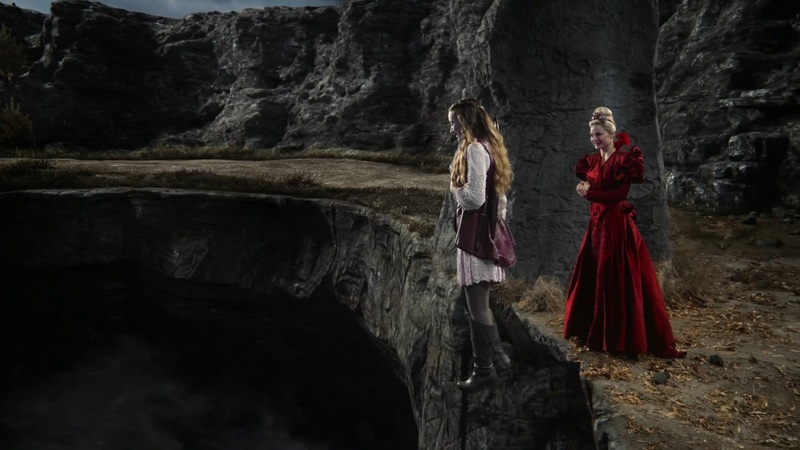 Alice and the Red Queen didn’t die when they fall off the cliff. Cyrus didn’t die when the Red Queen pushed him. Will didn’t die as well from falling off the ocean. Jafar made a deal with the White Rabbit and forced him to tell who else in Wonderland that matters to Alice; someone important enough for her to wish for their survival. Jafar tore his foot to get what he wanted and told him that he can make him whole again by turning back time. Feeling threatened, the White Rabbit told him of someone; someone important but is not in Wonderland. Who is this person outside of Wonderland that Alice loves? Ashley/Cinderella in Storybrooke? Her father, which, despite him not really loving her, she loves back? Looks like Jafar has captured yet another of the Red Queen’s pawns — the White Rabbit. One of the Tweedle’s little quirks is hilarious. His expressions are quite entertaining and fun to watch. The White Rabbit letting Cyrus escape showed his loyalties to Alice. This is also the first time that he sees that Cyrus really is alive. Is he going to start turning things around and play to their advantage? Will he help Alice and Cyrus to find each other? Young, dark Alice looked more like the part of Alice that was a lot more like the queen — desperate, vengeful, selfish. The Red Queen also almost looked frightened when she thought that Alice was going to kill her. But when Alice passed the test and they made it back up the great divide, the Red Queen was back in her old self almost instantaneously. Where is Elizabeth, also known as the Lizard, by the way? Where is the King now? Is he still alive? Did Will kill him in order to get Anastasia back? Now that Cyrus is out of Jafar’s tower, can he find Alice? Let us know what you think about the episode through the comment section below! Thank You for the iTunes Reviews! Your reviews encourage us and help others find the podcast! Please rate and especially write a review for us in iTunes. Visit any page on WONDERLANDpodcast.com and click the "Send a voice message" link to record and send a message right from your computer. ONCE podcast™ and WONDERLAND podcast™ are independently produced fan podcasts and not affiliated with ABC Studios. The views of the hosts do not necessarily reflect the views of ABC Studios or the cast and crew. Screenshots and sound clips from Once Upon a Time and Once Upon a Time in Wonderland © 2011–2014 ABC Studios. ONCE podcast, ONCE blog, and WONDERLAND podcast™ are trademarks of D.Joseph Design™ and Noodle.mx Network™.